Looking for a Christmas or Hanukkah gift? Got a birthday party coming up to attend? 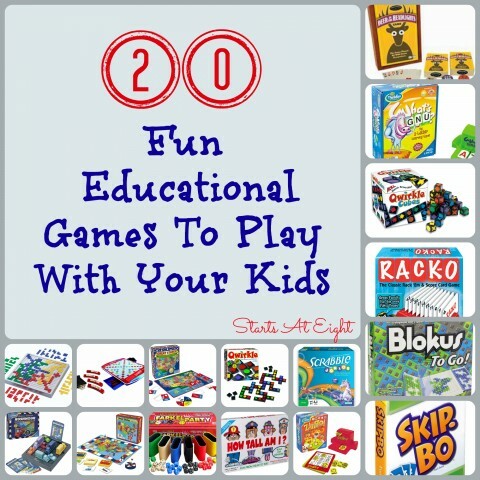 Or maybe you just need a new fun educational games to play at home with the kids? This is the list for you. These have all been hits in our house. Some a geared for younger, some older, but most can be played by a large range of ages and still be fun for all! Qwirkle – Qwirkle consists of 108 wooden blocks with six different shapes in six colors. Using the blocks, players attempt to score the most points by building lines that share the same shape or color. The simple setup makes this an instant winner for younger kids, while adults will enjoy strategizing to win. Although there is a method of keeping score we don’t often use it as the kids often get wrapped up in winning or losing. We just play to play and have so much fun doing it! Qwirkle Cubes – Qwirkle Cubes plays very much like Qwerkle. However, you have more control over your hand because you can roll and re-roll your dice to get the shapes you want. Also, because everyone plays open-handed, you can better judge your opponent’s future moves. Simply create rows and columns of matching colors or shapes to score most points. And, as always, no reading is required, making Qwerkle Cubes truly a game the entire family can play. What’s GNU? – A great way for younger players to practice their word recognition and spelling skills, this game is a fun confidence-builder. Players slide the “Letter Getter” forward to reveal two letter tiles, and then use them to create three-letter words by filling in the blanks on their Word-Starter cards. The player who spells the greatest number of words wins. We often don’t play for a winner and a loser, we just try to create as many words as we can. Zingo – In this fast-paced, energetic variant of Bingo, kids get a kick out of pulling the Zinger forward to reveal two mystery tiles, and then try to be the first to call out the tiles that match the images on their cards. The first player to fill his or her card wins by yelling “Zingo.” Two levels of play add zing to the competition. Zingo 1-2-3 – This is a variation on word Zingo, only with numbers and counting. With Zingo 1-2-3, players match numbered tiles to images on their cards. The first player with a full card wins by yelling “Zingo.” Two levels of play focus on counting and addition. Blokus – Blokus encourages creative thinking and has received a Mensa award for promoting healthy brain activity. The goal of this game is for players to fit all of their pieces onto the board. When placing a piece it may not lie adjacent to the player’s other pieces, but must be placed touching at least one corner of their pieces already on the board. The player who gets rid of all of their tiles first is the winner and strategic thinking helps as you block moves from your opponent. Blokus sometimes comes to an end because there are no more possible moves. Blokus is simple to understand, but the game’s complexity is revealed shortly after everyone begins to play. It can be addictive, even for those not normally into abstract games. Blokus is a catalyst for spatial thinking, as players form images in their mind before placing the pieces on the board. 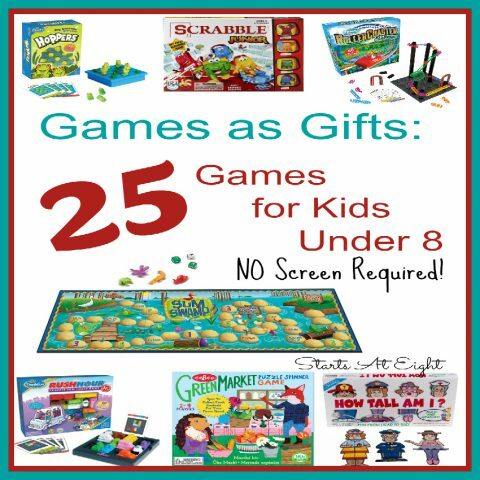 Children and adults can play together for hours of competitive family fun. Blokus To Go – This small, travel-size version of the award-winning game Blokus is a perfect on-the-go strategy game for two. It has been a great one for us to play one on one with the kids and the snap down pieces make it so you don’t bump it and mess up the game. The simple rules take less than a minute to learn, yet the game has the depth to challenge both beginners and experts alike. Each player chooses a color and takes a set of 21 pieces. The basic strategy is to place all your tiles on the game board while trying to block your opponent from placing their tiles. The first player places any piece of their choice at the starting point. Each color plays in turn. Two pieces of the same color must touch at their corners, but they cannot touch along their sides. The game ends when both players are blocked from laying down any more of their pieces. The winner is the player for whom the total area of his remaining pieces is the lowest.The Blokus To Go. pieces snap securely in place for easy storage and you can close up the game to finish later. Great States – Answer timed questions to show how well you know state capitals, locations and landmarks in this learn-as-you-play game of history and geography. Timer or no timer, looking at the map or not, our kids and I always learn something new when we play this game together! A fun way to explore some basic facts about United States. Great States Junior – This Great States Junior board game introduces kids to the map of the United States. The game provides the same fun and hurry-up action of the best-selling game Great States while you find the shape, picture or name along the red, white and blue game path. Skip-Bo – Out of a 162-card deck, two to six players are each dealt 20-card “stockpiles”; the first one to deplete their pile wins. Players draw from a central pile and stack their cards sequentially onto one of four “build” piles (for example, an eight onto a seven, a three onto a two), using plentiful Skip-Bo wild cards to break up static situations. A great game even for younger kids who can count from 1-12. Scrabble & Scrabble Junior We even use a Scrabble Dictionary to settle disputes and help out when someone is stuck (especially the children). Deer in the Headlights – Deer in the Headlights from Front Porch Classics is a fast-moving card and dice game the whole family will enjoy. Be the first to discard all of your cards, and you win the round. But watch out. A ”Deer in the Headlights” roll will stall your progress. If you roll a ”Car” or ”Running Deer” you can dump cards on your opponents. This goofy game is easy to learn. The compact set makes it easy to take the game on the go almost anywhere. Farkle – Take a risk and keep rolling to build your score. Or play it safe so you don’t lose your points in a Farkle. It’s a fight to the finish in this fabulously fun game of strategy and luck. The score sheets include the basic instructions for the game making it easy for even new players to keep up. How Tall Am I – Roll the die and stack up the parts to create a crazy character! With all the pieces in place, will your character measure up? Use the custom measuring ruler to find out. If your character is the tallest, you win! Rush Hour – Honk! Honk! It’s gridlock and the little red car can’t move. The player is a traffic cop in the Rush Hour Traffic Jam Puzzle where the objective is to get the red car off the road. To play, pick one of 40 challenge cards; solutions are printed on the back of each card. Then set up the cars and buses in a specified pattern on the 6-inch-square road grid. Move the vehicles one by one (obey those traffic laws!) until the red car can escape the traffic jam. There are four levels of difficulty. Kids can alternate turns with another player or just “play in traffic” alone. The game from Binary Arts received a national award from Mensa and is used in elementary school math classes. Racko – Since the “Fabulous 50’s”, families have enjoyed this Rack’em up fun-filled card game. Rack-O is timeless fun and a game I grew up playing with my parents! Players randomly slot 10 cards on their rack. The race then begins to draw and discard one card at a time until one player positions 10 cards in numerical order.